Unidentified missing man of mystery. The South Lake Tahoe Police need your help identifying a missing paddle boarder. The mystery paddle boarder rented a paddle board from Standup Paddle last Thursday and hasn’t been heard from since. 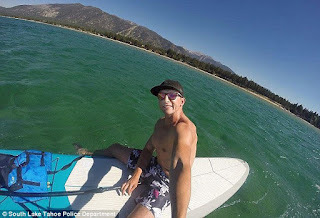 A paddle board was found adrift about a half mile from Timber Cove Marina in South Lake Tahoe. The board had been rented from a local rental store, but the store had no identification on the renter. The renter (who spoke with a heavy accent) paid with cash and left no personal information. He identified himself as “Morym”. A search began for the missing paddle boarder about 10:00pm on Thursday night. High winds made the search difficult that night and the following day. A paddle was found in eight feet of water that is believed to be associated with the paddle board. The search has continued for the man without results. When the paddle board was initially discovered, a GoPro camera and selfie stick was on the board. Police are now hoping to glean some information about the owner through pictures on the camera. There are pictures and video of the unidentified man at Heavenly Valley, Lake Tahoe, Italy, and Dubai. A person connected with GoPro Camera told me their company has been contacted by police for registration information on the camera. Registration data could reveal the owner’s identity if it is available. Police are asking for the public’s help to identify the mystery man or his whereabouts. Call South Lake Tahoe dispatch at 530-542-6100. Lt. Brian Williams, case # 1508-1117 is interested in your call.